Photos, pictures and images of The Château de Chaumont in in Chaumont-sur-Loire, France. Situated on a hill overlooking the river Loire between Blois and Ambrose, Château de Chaumont occupies an imposing strategic position to control the movement of traffic up and down the Loire. The strategic potential of this was realised by Odo I, Count of Blois who built the first castle there in the 10th century to protect his lands from attacks from his feudal rivals, Fulk Nerra, Count of Anjou. After his death the château passed to the Amboise family for five centuries. 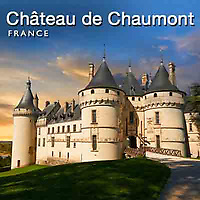 In 1560 Catherine de Medici, wife of Henry II of France, bought Château de Chaumont where she entertained such distinguished guest as Nostradamus. In 1559 Henry died and Catherine de Medici forced his mistress, Diane de Poitier, to exchange Château de Chenonceau for Château de Chaumont. In 1750, Jacques-Donatien Le Ray purchased the castle as a country home where he established a glassmaking and pottery factory. He was considered the French "Father of the American Revolution" because he loved America. However, in 1789, the new French Revolutionary Government seized Le Ray's assets, including his beloved Château de Chaumont. Today Château de Chaumont is a beautiful castle styled chateau surrounded by English naturalistic landscape gardens. Download photos and pictures of Château de Chaumont on line or buy as photo art prints.